Today’s blog tour stop for Crochet Adorned is with Kayte Terry of This is Love Forever. Kayte reviewed the book and did a cool collage and discussion of crochet in fashion (and how it goes from runway to crafter and back to runway)– don’t miss it! Also, Jennifer Perkins posted a Crochet Adorned inpsired doily bowl on her blog (for those who don’t crochet! You can also see my doily bowl tutorial for Craftstylish here). Tomorrow’s post will be by Erin Harris of House On Hill Road (I’ll post a link here when it’s up, but wanted to let you know since no post is planned for tomorrow). Erin will show off her own version of one of the projects in the book, and she’ll also be doing another giveaway, hooray! Be sure to stop by! And for locals, just a reminder that I’m doing a book signing, trunk show, and free crochet flower demo at The Yarn Shop this Saturday, August 22nd, from 1-3 pm. Please come by and check out the projects, say hi, and enjoy some refreshments. I set up the projects today and I must say, they look nice all together in one place. And now for a quickie roundup of things we did in Portland. We hit the Rose Garden– which was totally gorgeous! It had rained the night before so everything was dew droppy and lovely. 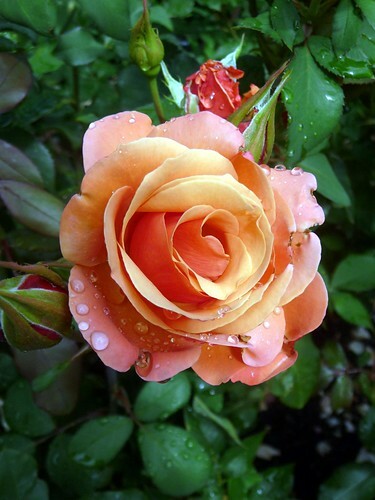 I’m partial to the peachy-pink-orangey-yellowish roses, in case anyone was wondering. We ate. And ate. And ate as much as we could. 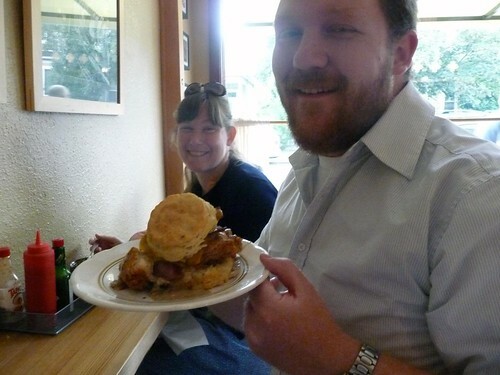 That biscuit Paul is holding has fried chicken, cheese, bacon and gravy on it. I got one too, along with a plate of fried green tomatoes at Pine State Biscuits. It was delicious! One of my other favorite things we ate were waffles from the waffle wagon. They make them with vanilla batter, fold them into a cone, and stuff them with the goodness of your choosing. Bozeman lacks good & cheap food, I really would have been happy to do nothing but eat the whole time we were in Portland. 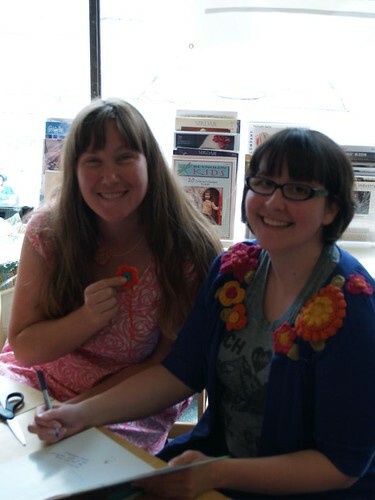 I also did some work-like things, such as signing books at Powell’s and teaching Susan how to crochet a flower. Susan and crew took me on a mini crafty tour, including a stop at Yarnia. 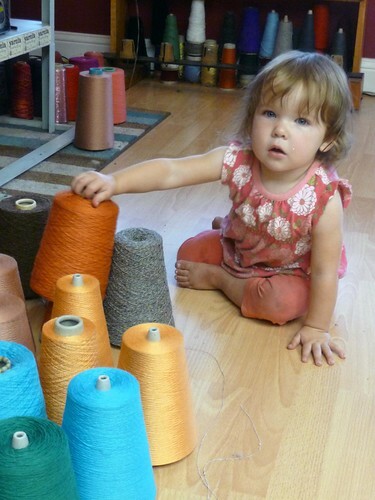 Pearl (Susan’s daughter) liked checking out all of the yarn. 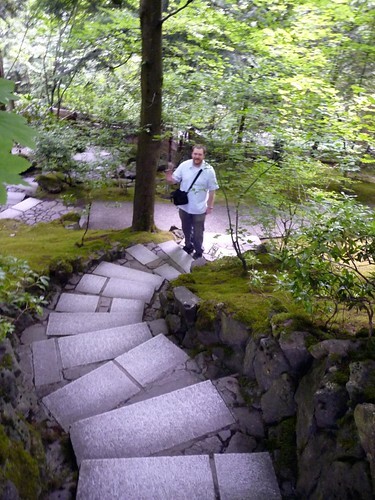 On our last day we had a moment of Zen at the Japanese Garden, and took in the views on the Willamette River. 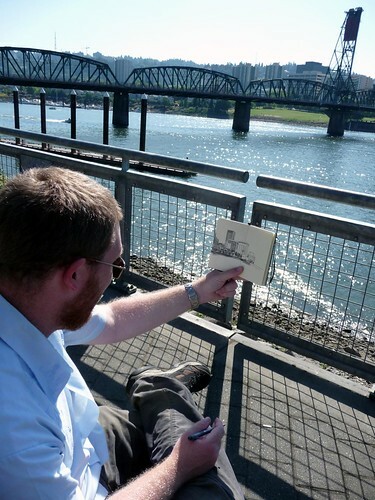 (You can see Paul’s Portland Post Here–his is better, it’s true; and more of his drawings in his etsy shop). I’ve totally neglected the “getting there” and “getting back” parts of the trip (we drove) but I haven’t edited the photos yet…so that’s for another day! Wow, what an amazing tour you are on! Your trip to Portland looks fabulous. We have always wanted to visit that city. I always love Paul's drawings, so thanks for sharing that too. Such neat pictures! Makes me want to go back to Portland. It really is a nice city. We just got a new pastor, they come from Grand Rapids MI. They are amazed at the high price of food and the low wages in the Bozeman area. Hubs calls it the "$20,000 dollar view" meaning you have to sacrifice about that in wages to live in such a beautiful place.